Our organic Quick Oat Flakes have the same nutritional value as all our other organic oat products. Quick Oat Flakes are whole grains, that are high in iron, a high source of fibre, and sodium-free. 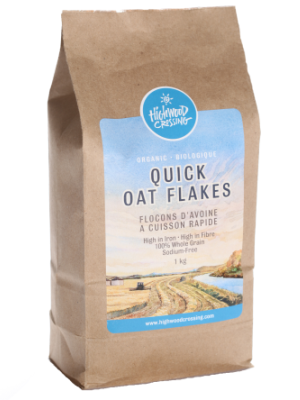 Like all our products, these Quick Oat Flakes are certified organic and non-GMO. Made in a nut and peanut free environment with no traces of soy or dairy. Milled at an oat-only facility. Whole oats that have been de-hulled are called Oat Groats. Oat Groats that are steamed and flattened are called Rolled Oats and the larger flakes are called “old fashioned”. 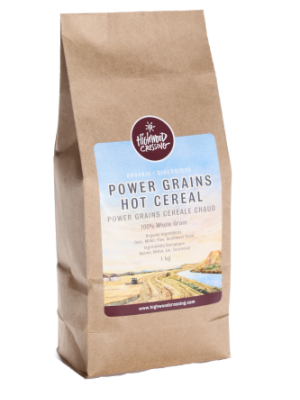 Rolled Oat Flakes cook in about 15-20 minutes and are generally preferred for their fuller, nuttier flavour. 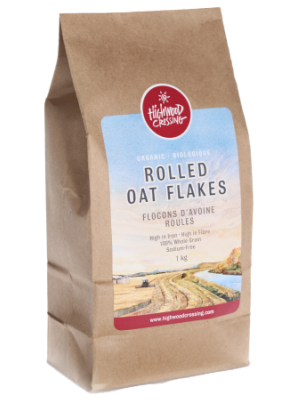 Because they are larger, Rolled Oat Flakes remain visible in a finished baked product. Quick Oat Flakes are simply Oat Groats that have been “steel-cut” and then rolled into smaller flakes. Quick Oats have the same nutritional properties as Rolled Oats but they are smaller and they cook much faster- in about 5 minutes. If you are really in a hurry, they can be cooked in the micro-wave in a few minutes. Quick Oat Flakes are ideal for use in baked goods because they break-down and are not visible in finished baked products. Although oats contain gliadin (a protein that contributes to the formation of gluten) we have many clients with gluten-sensitivities who are able to enjoy our oats. 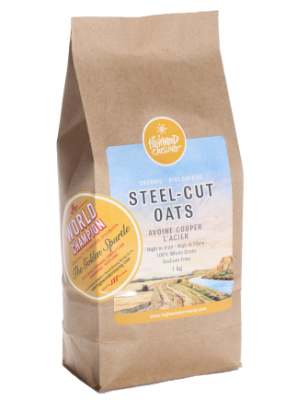 Our oats are milled in a dedicated, oat-only facility, meaning that our oats are free of contamination from other high gluten products such as wheat. However, we always recommend that you conduct you own trials to determine what foods are right for your specific condition and diet. You can read more about oats and gluten here. Directions: Stir 1 cup of Quick Oat Flakes into 2 cups of boiling water. Cook on low for 2 to 5 minutes. Stir frequently. Serves 2. A fast and healthy breakfast doesn’t get any easier than this! Bring water to a boil and add remaining ingredients. Cook for approximately 5 minutes and stir once or twice. Makes 4 (1/2 cup servings). Wholesale Pricing Is Available For Businesses, Bulk Users, Retail Stores, Restaurants & Buying Groups.